By 2023, more than 90% of vehicles produced will be connected, adding a range of features to both consumer and commercial autos. Automotive electronics is the fastest growing end application in the semiconductor market, but what systems will see the highest penetration rates? Currently, self-driving cars grab much of the media attention, and for good reason. Semico estimates that today’s self-driving car has $21,525 of additional electronics. However, recent tests of ADAS vehicles produced less than stellar results. IIHS (Insurance Institute for Highway Safety) evaluated five models sporting advanced driver assistance systems on a test track, with mixed results. These results combined with the pedestrian fatality in Tempe, AZ by an UBER car are setbacks for widespread adoption of self-driving cars. However, Semico predicts that by 2023, the automotive semiconductor market will grow to $73 billion and cars with some level of driver assist systems will comprise 34% of the total vehicle production. The growth rate for automotive electronics is high because there are a number of electronic systems that are growing at a faster pace than ADAS and being widely adopted. 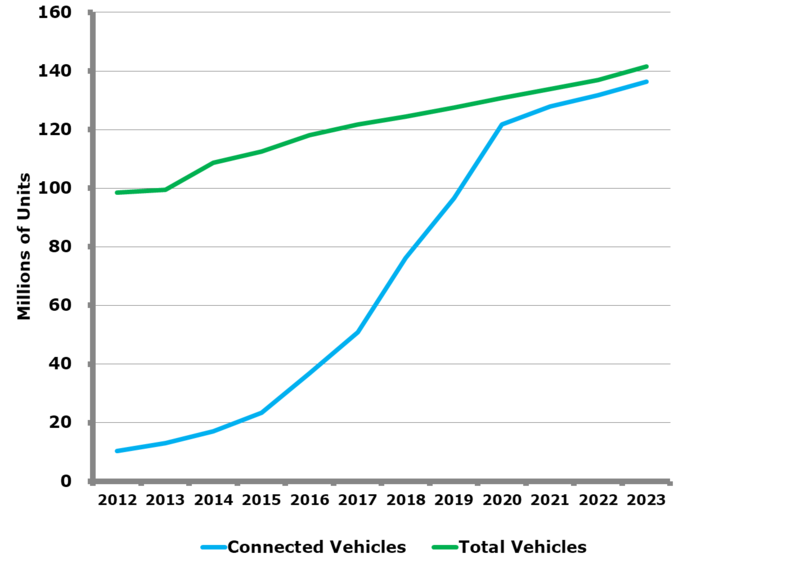 The connected car will experience a fast penetration with over 90% of vehicles produced in 2023 being connected. To be clear, all self-driving vehicles will be connected. However, the connected car has several valuable functions for safety, reliability, advanced monitoring and diagnosis that will be installed in other mainstream vehicles. These features will drive high penetrations rates for the connected car. There has been a significant effort to bring connectivity to the car and its ecosystem. Currently there are over 250 companies involved in the development of the connected car from semiconductors, systems, software and applications. What can the connected car enable? The 250 companies in this segment of the industry have attracted nearly $40 billion of capital funding for what is becoming the cornerstone to future vehicle electronic features and functions. In order to deliver some of the features for autonomous driving, connectivity in the car is essential. The market for connected vehicles is expanding; in 2017 41.7% of US manufactured vehicles were connected. This will expand to 96% by 2023. On a worldwide basis, 32% of vehicles were connected in 2017 and will grow to 92% by 2023. Many manufacturers are incorporating 4G, and eventually 5G, connectivity into their vehicles. Audi claims to have been the first to include connectivity in 2013. Most GM vehicles are connected via OnStar. It is a standard feature in most luxury models and an option in others. Many of the lower-end cars use a smartphone and its data plan to be connected. The graph below depicts the number of connected vehicles versus total vehicles sold. In 2018 the connected vehicle growth rate will be just over 50%. The CAGR for connected vehicle between 2017 and 2023 is nearly 22%. While newly manufactured vehicles are rapidly becoming connected, vehicles remain on the road for many years and usually have more than one owner. In the past, the long automotive life cycle has meant that it takes more than 10 years to see the impact of a new technology in all cars on the road. 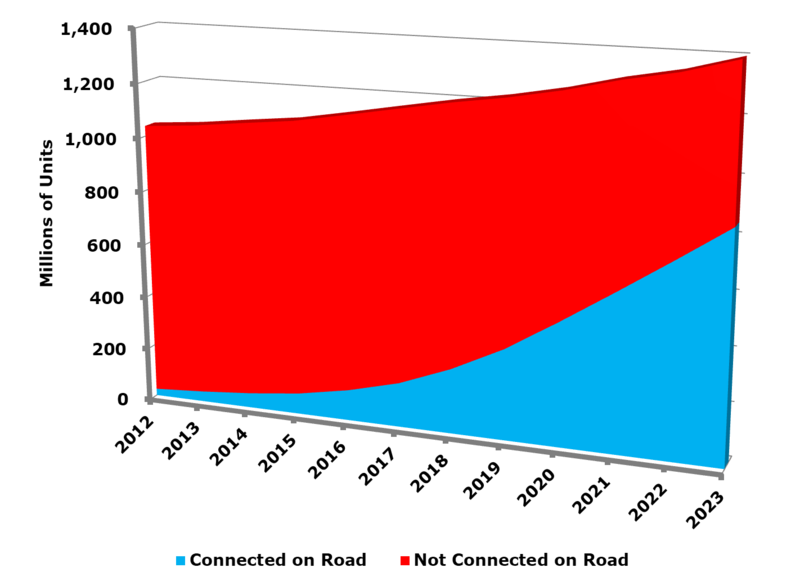 The chart below shows that, even by 2023, 60% of all the vehicles on the road will be connected. The recent IIHS ADAS report should not deter any progress toward continued growth of automotive electronics over the next five years. ADAS and self-driving cars will continue to be the catalyst for improving systems and the quick adoption of connected cars will open the door to a variety of automotive applications for comfort, operational efficiency and safety. We should also note that the IIHS is a nonprofit organization funded by auto insurers. Safer cars should result in lower insurance rates, but don’t expect to see any price reductions when you buy your new car equipped with ADAS. The automotive insurance industry is facing a major revamping (such as usage-based insurance) and they’ll be trying to find ways to safe guard their insurance premiums. For more data and information on the automotive semiconductor market, checkout Semico’s report “Automotive Semiconductors: Accelerating in the Fast Lane” by contacting Rick Vogelei at [email protected]. Jim Feldhan is the president of Semico Research.